WoofsnWagsDogTraining.com provides information about Pit Bull training as well as information on how to contact me here in the Minneapolis, Minnesota area to train your Pit Bull or other dog. I am a Certified Animal Behaviorist and graduate of the Animal Behavior College in California, USA. I’ve loved and raised dogs all of my life and have never found any other being who is so loyal, trustworthy and anxious to please. It is such a joy as well as the fulfillment of my life long dream to be able to help other dog owners learn how to successfully communicate their wishes to their beloved furry best friend and to watch their dog respond to their wishes. My training methods are based on positive reinforcement methods. The Animal Behavior College has trained more successful animal behaviorists here in the United States than any other dog training school. I am so proud to be able to say that I am a graduate of such an esteemed college! Come visit my website at: https://www.woofsnwagsdogtraining.com today! ANNOUNCEMENT! We have some extremely exciting news: Our Woofs N Wags Dog Training website has been invited to be featured on the world-wide website, “Dog Trophy” (https://www.dogtrophy.com) where veterinarians and other amazing professionals share valuable information with dog owners around the world! (I have been invited to be featured as their Pit Bull Expert as well!) We are extremely excited about this opportunity to not only share, worldwide, but to also validate the truth about the amazing, wonderful Pit Bull dog breed! This is a dream-come-true! (She is the one in the middle of the puppies who are nursing.) Chloe is extremely affectionate and very comical! Whenever I sit down on the sofa in our family room, I can see reflections in the television screen of our backyard through the patio doors. All of a sudden there will be a little white being racing one way across the backyard, then back again, the other way! My husband and I have concluded that Chloe has an imaginary friend who she plays with out there! She is very good at entertaining herself. The photo at the bottom is one of her looking over the top of the sofa at me – whenever I sit at my computer, my back faces the back of the sofa. One day when I thought she was still napping on the sofa I heard this one, big “Woof!” I turned around to see her little face staring at me, and laughed and laughed – it was as if she was saying, “Okay, you’ve been doing that long enough! It’s time for you to come play with me!” She is such a little clown and has me laughing a good deal of the time! She and our elderly Pittie love each other very much. They cover each other’s faces with kisses and play “chase” together in the backyard everyday, We sometimes worry about “Dazie” our elderly Pittie though since Chloe has very sharp little puppy teeth and likes to nip at Dazie’s chin. I purchased a muzzle made of nylon today for Chloe (so she couldn’t hurt Dazie) and she had it off within minutes. She absolutely hated it! (H-m-m . . . I wonder what on earth I expected! Silly me.) The most that Dazie will do to correct Chloe is to take her front paw and knock Chloe over! 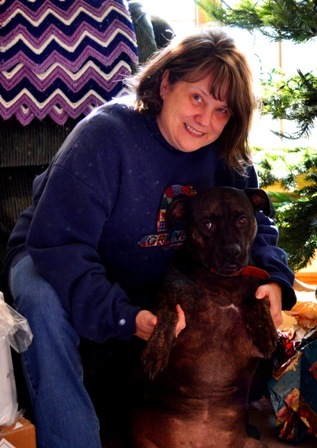 Both my hubby and I are incredibly “taken with” the wonderful, amazing Pit Bull and have wanted to be sure we still have one when Dazie eventually passes-on (she’s twelve years old now.) We know that we couldn’t have done better than our sweet little Chloe and I thank God everyday for our new little angel. This is Dazie Being Ferocious – Okay, so we’re at this campground in Maine, right? Dazie is sound asleep – until this guy next door begins shouting at his wife. Dazie does NOT like aggressive people – especially aggressive men! She immediately begins barking, snarling (the way only Pit Bulls can) and this is how she looked. I burst into hysterical laughter! (Sorry the picture is blurry. I was laughing too hard to hold still.) But I’ve got to tell you that the guy next door instantly closed his abusive yap! YAY Dazie!! Stevie is a good dog. He doesn’t eat from the table or have accidents in the house. 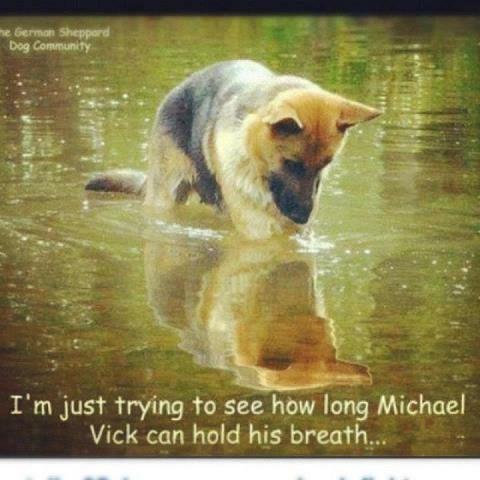 And he never pulls on his leash. The white-and-tan Staffordshire terrier also has a special talent: He alerts caregivers when his little boy, Anthony Merchante, is going to have a seizure or has trouble breathing. Anthony’s mother, Monica Alboniga, tried for two years to convince the Broward County School Board to permit Stevie, a trained service animal, to accompany the 7-year-old on campus. But school administrators repeatedly said Stevie didn’t belong at school. And they hoped that a Fort Lauderdale federal judge would agree with them. Instead they got a scolding. Last week, U.S. District Judge Beth Bloom ruled that Stevie should be allowed to join his human friend at Nob Hill Elementary — and without a series of requirements the school district had tacked on. As the lawsuit progressed in federal court, the school board allowed Stevie to go to school every day, but administrators continued to fight the case. Had the district won, Alboniga’s lawyer said, 4-year-old Stevie almost certainly would have been expelled. Anthony suffers from a host of serious disabilities: He has cerebral palsy, spastic paralysis, a seizure disorder, and he cannot speak. To get around, he depends on a wheelchair, to which Stevie is tethered most of the time. Alboniga, 37, who is raising her son alone, paid to obtain and train a dog up to the specifications of Assistance Dog International Standards, records say. Stevie can aid caregivers in a variety of ways: He can step onto Anthony’s wheelchair and lay across the boy’s lap; once there, the dog is trained to help stabilize Anthony’s head so his airway isn’t impeded. “Stevie, the Pit Bull was also trained to ‘tell’ or ‘alert’ human responders in the event that [Anthony] was experiencing a medical crisis,” Bloom wrote. The dog can jump on a sensor mat that activates an alarm, or bark to get the attention of caregivers. He also wears a red service dog vest that holds medical supplies, as well as detailed instructions on how to respond to medical emergencies. All 50 pounds of Stevie rest next to Anthony in bed each night, and the boy and dog are virtually inseparable That’s partly by design. It’s best if service animals spend almost all of their time with their “targets,” trainers say, and long separations diminish the animal’s “responsiveness and effectiveness,” Bloom wrote. Alboniga first approached the school board in May of 2013, and submitted a formal request for the dog two months later. In its reply in August 2013, the school board said Stevie must obtain a host of vaccinations that rarely are applied to dogs, required Alboniga to obtain costly liability insurance, and mandated that she provide, at her own expense, a “handler” for Stevie. The requirements, said Alboniga’s lawyer, Matthew Dietz, amounted to “an impossible barrier,” and violated federal civil rights laws that give preference to the choices of disabled people. “The fact that the judge said the school board’s rules made no sense vindicates this woman’s belief that what she was doing for her son was the right thing,” Dietz said. For the first four months that Anthony attended Nob Hill Elementary School as a kindergartener, beginning in August 2013, Alboniga worked, at the district’s requirement, as Stevie’s handler herself. Later, the school board appointed a custodian to work as Stevie’s handler. His responsibilities were “to walk Stevie alongside [Anthony] with a leash, instead of allowing Stevie to be attached” to the boy’s wheelchair, and to take the dog outside to urinate. The custodian also ensured other children did not try to play with the dog. But administrators continued to assert in the lawsuit that it was not the district’s responsibility to help the boy keep Stevie at school. Anthony’s “individual educational plan” — a detailed accounting of the school’s accommodations to the child — does not mention Anthony’s use of a service dog, Bloom wrote. “Congress specifically intended that individuals with disabilities not be separated from their service animals, even in schools,” the DOJ wrote. The school board contended that it wasn’t necessary for Stevie to accompany Anthony to school since the elementary’s staff already was trained to perform the same tasks as Stevie. The district also argued that, even if Stevie was permitted on Nob Hill’s campus under the ADA, it was not reasonable for the district to bear the costs of the dog’s handler. 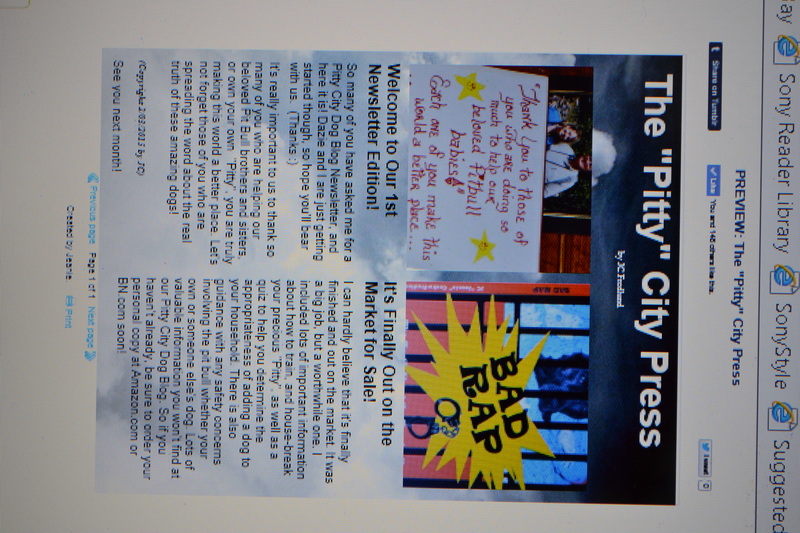 Dazie and I have just completed our first monthly Pitty City Press Newsletter! To receive your free newsletter every month, just print your e-mail address in my comments section on any page here at the Pitty City Dog Blog. 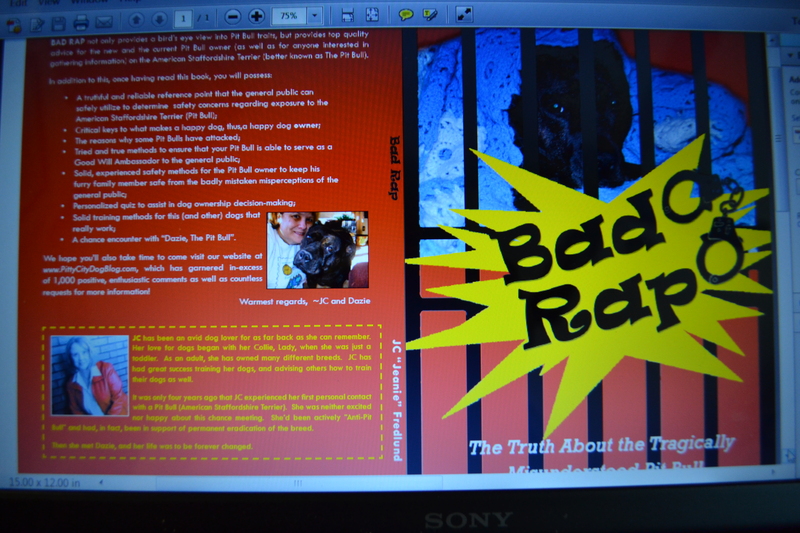 OR e-mail your e-mail address to me at: http://www.badrap4bulls@gmail.com! MANY OF YOU HAVE REQUESTED THAT I SWAP AUTHORING WITH YOU ON YOUR WEB-SITE. Just incase this video doesn’t post correctly, just go to http://www.Facebook.com/NinaWahl. There is more than one “Nina Wahl” on Facebook, so you may need to type her name into your Facebook Search Bar and go from there. It is worth it! This is a must see! 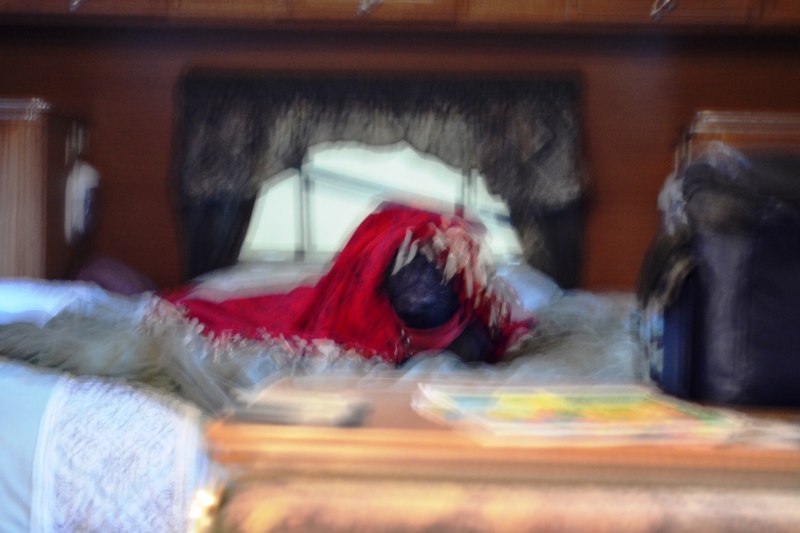 UPDATE ON MAN IN PHOTO TORTURING DOG! Patricio Millar is a soldier of the embassy in Santaigo. As such he should be held to the highest morals and should exhibit exemplary behavior. Instead, Mr Millar chose to cruelly abuse his own dogs, photograph the horrors and post the pictures on social media for the world to see. He punched and throttled one, buried it in sand up to its neck and docked its tail without anesthesia. There is photographic proof of these acts. We are sure he has committed more heinous acts of abuse toward these poor trapped dogs.What is especially frightening is that he has no remorse. In fact he is proud of it..posting pictures on Facebook like there is nothing wrong with it. As is well known, animal abusers of this type very often graduate to hurting and sometimes killing human beings.This man is that type as his nonchalance about exhibiting pictures of himself committing such cruel deeds ( not to mention criminal offenses) shows. We call upon you to make sure this man is sentenced to the maximum under the Chilean laws . WPLR 99.1 New Haven‘s photo. via IF YOU HAVE A ROOT CANAL…BEWARE!